Don’t Stop Believin’. If Mark Burchill was to pick a song that sums himself up on what has been one helluva journey this season then that would be it. 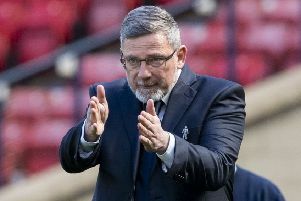 Even in Livingston’s darkest moments, the Lions manager was convinced they could overcome a five-point deduction and some rotten form to secure safety in the Championship. And on Saturday, they did just that. Kyle Jacobs’ penalty in the final quarter of a nervy, tense 1-0 victory over Queen of the South was not only enough to keep the Lions off bottom spot but, paired with Alloa’s 3-0 win over Cowdenbeath, it allowed Burchill’s men to rise into eighth spot and even avoid the relegation play-offs. Considering Livi were anchored to the bottom of the league for five treacherous months, their recovery has been quite remarkable. One man’s belief in his team, however, never wavered. Even when Livingston were stripped of five points in November for tax irregularites during a previous era, Burchill – at the time assistant coach – kept the faith. Appointed manager late last year, he stressed Livi were good enough to stay up. After losing 2-1 at home to Dumbarton in a perennial six-pointer back in March, most people had shut the lid on Livingston’s coffin, but Burchill kept playing the same record, reiterating he had confidence in his players. They responded by winning the Petrofac Cup final with a 4-0 rout of Alloa in early April and from then on never looked back, picking up 13 points in their last six games to avoid the drop. “I’ve said since the start we would catch those teams,” a delighted Burchill said as his men condemned Cowdenbeath to League 1 football and Alloa to the dreaded play-offs. “Some people were negative about it, didn’t believe in it, but that’s up to them. I firmly believed from day one that I could do it with the guys in the dressing-room. “We’ll never see a season like this with the amount of all the off-field stuff – Darren Cole’s cousin dying not long ago and my dad also died just a couple of weeks after I’d taken the job. He was a huge part of my football career so it’s been a hell of a time, but to get through it is absolutely fantastic. Livingston went into the match knowing that they needed just a point to go into the play-offs which, given the shoogly nature of their season, would have been deemed a minor successs. Queens, who had nothing to play for with fourth spot already in the bag, kept the game tight and there was little in the way of goalmouth action until Danny Mullen won a penalty on 80 minutes and vice-captain Jacobs showed his mettle by thrashing the ball high beyond the despairing dive of Zander Clark in the Queens goal. Coupled with Alloa’s 3-0 home win over the Blue Brazil, it was enough to keep the Lions in Scotland’s second tier for another year. Despite the players’ heroics, the majority of the first-team squad are out of contract at the end of this month, with the club having been unable to offer new terms given this season’s turmoil. Burchill’s contract is also up, but he’s is keen to meet with club’s board of directors and move things forward. Livingston: Jamieson, Sives, Talbot, Fordyce, Kyle Jacobs, Keaghan Jacobs (Cole 80), O’Brien, Hippolyte (White 67), Gallagher, Mullen, Pittman (Glen 90). Subs: Walker, Boulding, McKenna, Sekajja. Queen of the South: Clark, Dowie (Pickard 46), Durnan, Higgins, Russell (Carmichael 81), Kidd, Paton, McShane, Lyle (Smith 58), Hooper, Smith. Subs: Atkinson, Holt, Reilly, McKenna.